When I first tried this homemade vanilla frosting recipe, I couldn’t stop eating it! It truly is just as good (actually, BETTER) than the store-bought kind, and it goes great on cakes or cupcakes. Its really easy too! 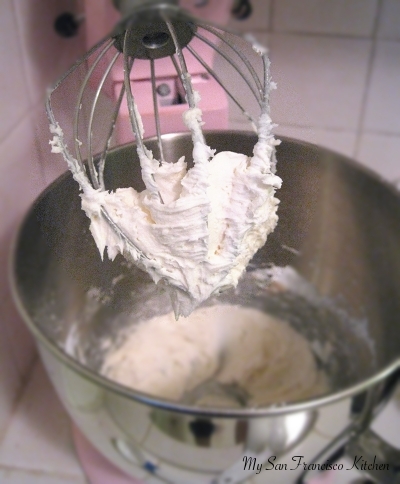 Using the whisk attachment, whisk butter, vanilla, and 1 cup of sugar together on medium speed until smooth. Add remaining sugar and 1 tbsp milk. Whisk on medium to high for a few minutes until frosting is smooth. This entry was posted in Dessert and tagged cake frosting, cupcake frosting, frosting. Excellent recipe. Makes just enough to frost 1 dozen. It is soooo! good soooo! easy make it you want be sorry! just made this tonight for my dorm guys–vanilla cake topped with your amazing frosting and fresh kenyan strawberries. SO good, and the guys raved about it. this is definitely going in my shortlist of frosting recipes. thanks! Does this frosting have to be refrigerated? Or can I frost a cake and leave the cake sitting out or would the cake need to be put in the fridge?